Parents today are all too familiar with the problem of worms in children. Tiny, threadlike creatures, they cause terrible itching. How did parents in the past respond to this common childhood complaint? In the following paragraphs, I use early modern collections of medical recipes, doctors’ casebooks, and medical treatises, to find some answers. L0016479: Karl Asmund Rudolphi, ‘Entozoorum sive vermium intestinalium histor’: courtesy of the Wellcome Library, London. Worms were defined as ‘Annimals generated in the body, variously hurting the Operations of the Body’. Growing out of rotting food in the stomach, these creatures were ‘deservedly reckoned among those Diseases which frequently afflict Infants and Children, seldom…troubling people of Years’. The reason, according to the physician John Pechey, was that ‘Children eat greedily, and are delighted with…sweet things’, such as summer fruits and candied cherries, foods which easily putrefy and ‘nourissheth and fedeth’ the worms. Children’s bodies provided worms with the ideal conditions to grow, because they were thought to be more moist and warm than adults, qualities which promoted putrefaction. The symptoms of worms were well known. ‘Worms are known to be in a Body’, stated Daniel Sennert in 1664, ‘when there is much spittle and a stinking breath, troublesom sleep, gnashing of teeth, crying and bawling’. If the infestation continued over a long period, the patient became emaciated, as Walter Harris observed in his casebook: his thirteen-year-old patient ‘was much liker a Skeleton than a live Boy: His Face was like that of one raised from the Grave, his Eyes hollow; his Nose sharp, and his bones only covered with skin’. The child’s ‘ratling joynts’ could scarcely ‘carry him from one end of the room to another with the swiftness of a Snail’, lamented Harris. Wellcome Library, MS 1340 (Katherine Jones, Collection of medical receipts, c. 1675-1710), f.87v. Image courtesy of the Wellcome Library, London. How were children treated? ‘A special regard’, declared John Pechey in 1697, ‘is to be had to the Methods and Medicines, for Children by reason of the weakness of their bodies, cannot undergo severe methods or strong Medicines’. Instead of using the usual remedies of the day – vomits, purges, and bloodletting – children were to be treated with milder medicines, such as ointments and suppositories. 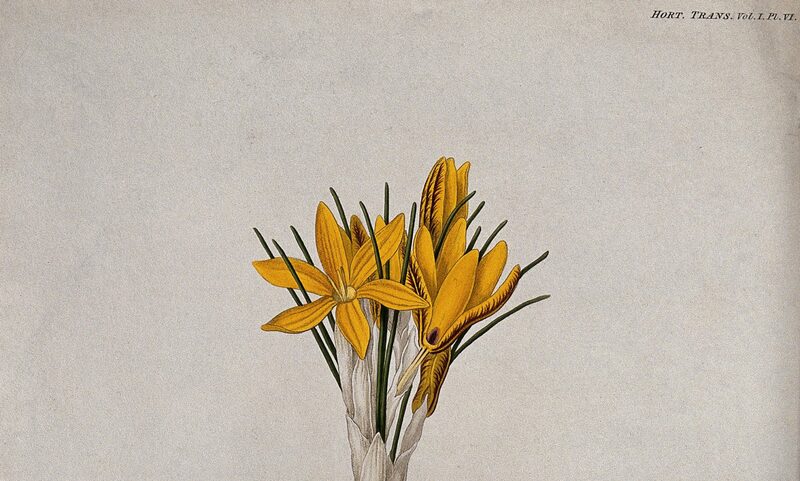 Medical texts and manuscript collections of remedies are replete with recipes to remove worms. 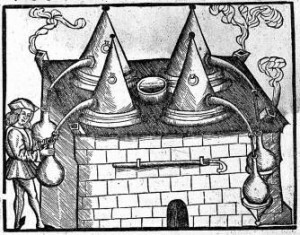 In 1664, the doctor ‘J.S.’ prescribed suppositories made of honey, by which ‘the Worms [are] drawn by sweetnesse, [to] the lower parts of the Guts’, where they could be voided by natural defecation. Like children, worms loved sweet things, and could be tempted out of the body this way. Other, more bizarre treatments were recommended. In the late 1600s, Lady Mary Dacres suggested the following ‘rare thing for Wormes in…children’: ‘Tak[e] five live earth worms…sew them up in a piece of muslin, and lay them upon the navill’. The London gentlewoman Katherine Jones suggested a similar remedy: she instructed, ‘Take Earth worms’, and put them ‘in a linnen bag, and bind the bag to the navel of the Child all night’. It is not clear how these treatments were thought to work, but it is possible that people believed there existed a sympathy between similar creatures, so that when the earthworms died, so too did the worms in the child’s body. Whilst early modern medicines might seem odd to modern eyes, it is clear that doctors were motivated by compassion. Francis Glisson noted in 1651 that he wished to make his remedies ‘grateful & pleasing to the sick Child’. Clearly, children were regarded as different from adults, and in need of special medical treatment. 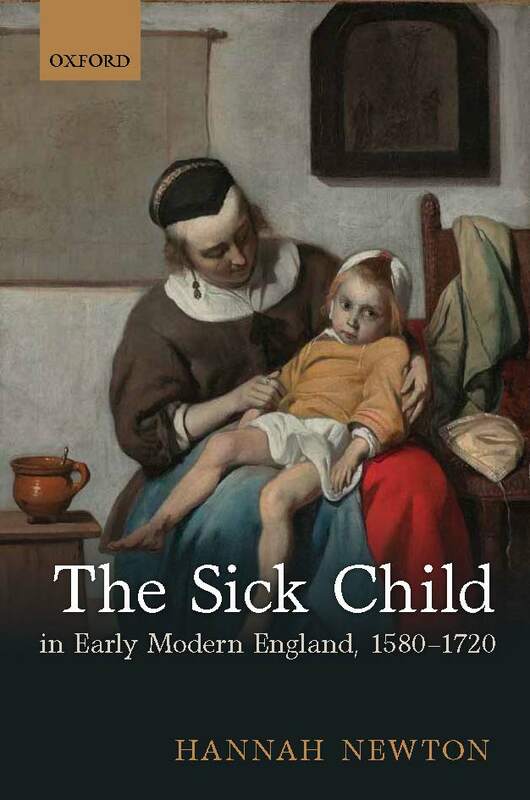 Dr Hannah Newton is Wellcome Trust Fellow at the University of Cambridge, and the author of The Sick Child in Early Modern England, 1580-1720 (OUP, 2o12). Her current research project is about recovery from illness in the early modern period. J.S., Paidon nosemata; or childrens diseases both outward and inward (London, 1664), 167. Franciscus Sylvius, Dr. Franciscus de le Boe Sylvius of childrens diseases…also a treatise of the rickets (London, 1682), 127. John Pechey, A general treatise of the diseases of infants and children (London, 1697), 119. Thomas Phaer, ‘“The Booke of Children: The Regiment of Life by Edward Allde” (London, 1596, first publ. 1544)’, in John Ruhrah (ed. ), Pediatrics of the Past (New York, 1925), 157-95, at 182. Nicholas Culpeper, Culpeper’s directory for midwives: or, a guide for women . . . the diseases and symptoms in children (1662), 239. Daniel Sennert, Practical physick the fourth book in 3 parts: section 2: of diseases and symptoms in children (London, 1664), 259. Walter Harris, An exact enquiry into, and cure of the acute diseases of infants, trans. William Cockburn (London, 1693), 129. Pechey, A general treatise, 15. 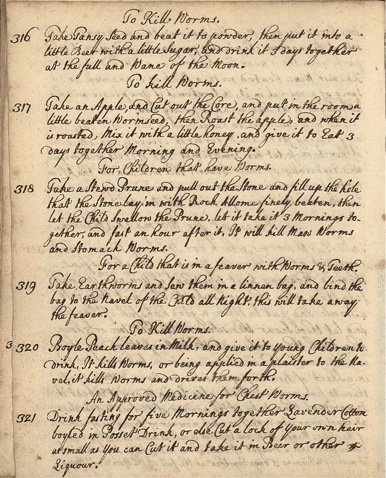 British Library, Additional MS 56248 (Lady Mary Dacres, ‘Recipe Book…for cookery and domestic medicine, 1666-96’), 59v. Wellcome Library, MS 1340 (Katherine Jones, Collection of medical receipts, c. 1675-1710) 87v. 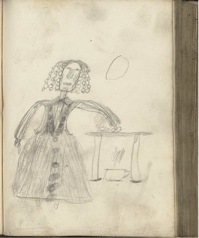 Francis Glisson et al, A treatise of the rickets being a diseas common to children, trans. Philip Armin (London, 1651), 344.